Jay Mancuso helped the Boca U23 men’s soccer team up their MSSL unbeaten streak to ten games on Sunday as they defeated the Timberbirch Athletic Association and Milmay FC at Ft. Dix to improve to 9-0-1 in league play and remain in first place on top of the MSSL U23 men’s standings for the fifth consecutive week. Mancuso tallied 4 goals and two assists on the day. FT. DIX, NJ (July 9, 2006) – The Jersey Shore Boca U23 men’s soccer team upped their Mid-Atlantic Summer Showcase League unbeaten streak to ten games on Sunday as they defeated the Timberbirch Athletic Association 5-2 and Milmay FC from South Jersey 2-1 at the Doughboy Loop Fields at Ft. Dix to improve to 9-0-1 in league play and remain in first place on top of the MSSL U23 men’s standings for the fifth consecutive week. Boca is the only undefeated team in the MSSL U23 men’s division this season. In the first game of the day against TBAA which saw a combined 5 goals scored in the first half by both teams, Boca started the onslaught in the 3rd minute after a miscue by the TBAA keeper led to an unassisted goal by Bucknell University sophomore Mark Schmiegel (Toms River), his second of the season. Boca made it 2-0 in the 19th minute when Towson University junior Andy Fraggos (Marlboro) buried low shot to near post off a cross by Jay Mancuso (Toms River). TBAA narrowed the gap to 2-1 in the 25th minute by chipping Boca keeper Jon Curry-Edwards (Spring Lake Heights – University of Delaware) from 15 yards out. Mancuso, who started 13 games last year for Central Connecticut State University, assisted again in the 30th minute as he played a beautiful one-touch give and go to Syracuse University senior Andrew Hawtin (Toms River) who pushed-up from his central defender spot and beat the TBAA keeper from 10 yards out with the eventual game winner. The first half scoring ended in the 37th minute when Boca’s Justin Fuccello (Brick) back-heeled a pass inside the TBAA penalty area to a streaking Mancuso who tallied his first goal of the day with a one-time shot to the near post making the score 4-1 Boca at the break. After TBAA (2-6-1) tallied their second goal of the match in the 60th minute, Hawtin found Mancuso again 10 minutes later inside the penalty area from the left side about 30 yards out who placed a high shot into the far netting for his second goal of the day to end the game 5-2 Boca. In the second match of the day, Boca squared-off against a strong Milmay FC side that began the second half of the MSSL season in third place in the U23 MSSL standings. In the 6th minute, Boca keeper Chris Konopka (Toms River – Providence College) cleared a ball out of the back to Versh Tivzenda (Marietta, GA) about 20 yards past midfield. The Stevens Institute of Technology junior flicked the ball to a streaking Mancuso who made a perfectly timed run beating Milmay’s offside trap and buried his third goal of the day one-on-one against the Milmay keeper. Boca’s defensive corps of Hawtin, Sean Cahill (Whiting – West Virginia University), Teddy Niziolek (Clifton – Seton Hall University), Tyler Stoviak (Malvern, PA – Syracuse University), Danny Haydu (Toms River – Monmouth University) and Jimmy Coletti (Warren – Assumption College) limited the Milmay scoring opportunities for most of the match. Mancuso tallied his fourth goal of the day and the eventual game winner in the 63rd minute when he stripped the ball from a Milmay defender about 20 yards out on the right side, went around a second defender and beat the keeper to the far post. Milmay, which drops to 5-2-2 in league play, scored their only goal of the game in the final minute of the match when Boca failed to clear a corner kick out of their end making the final 2-1 in Boca’s favor. Through 10 league games, Boca has scored twenty-eight goals while only allowing nine. Mancuso leads Boca in overall scoring with 8 goals and 6 assists followed by Fraggos with 5 goals, including 2 game winners. Seton Hall University junior Justin McGrath (Brick) is third with 4 goals and 1 assist followed by Schmiegel with 2 goals and 4 assists. The Boca goalkeeping duo of Konopka and Curry-Edwards have a combined goals against average of 0.90 through 10 games. Next Saturday and Sunday, Boca travels to Horsham, Pennsylvania to compete against fifteen other top U23 teams from the Northeast and Mid-Atlantic states in the United States Adult Soccer Association (USASA) Regional U23 Championship Tournament which will take place on July 15th and 16th at the Ukrainian National Sports Center. The winner of the USASA Regional U23 Championship will advance to the USASA U23 National Championship held in Frisco, Texas August 4th through August 6th. 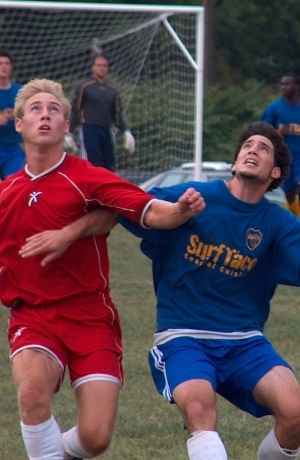 The adult level of MSSL is specifically designed for collegiate players under the age of twenty-three and is fully sanctioned by the USASA, the national governing body for adult amateur soccer.